Get the most out of your PostgreSQL servers. PostgreSQL can scale rather well vertically. The more resources (CPU, memory, disk) that you can make available to your PostgreSQL server, the better it can perform. However, while some parts of Postgres can automatically make use of the increased resources, other parts need configuration changes before improvements can be noticed. Read on to learn more about how to ensure PostgreSQL makes full use of the system you’re running it on. PostgreSQL has a traditional process architecture, consisting of a master process (called the postmaster) that spawns a new process (called a backend) for each new client connection. This means that if there are more CPU cores available, more processes can run simultaneously, and therefore backends do not have to contend as much for CPU availability. CPU-bound queries will complete faster. so that rogue apps cannot end up hogging too many connections. The PostgreSQL server can spawn process to take care of housekeeping tasks, like vacuuming, replication, subscriptions (for logical replication) etc. The number of such workers is not determined dynamically, but just set via configuration, and defaults to 8. Increasing this value can result in speedup of maintenance jobs, parallel queries and index creation. If you have idle CPUs and parallelizable queries, increasing these values can speedup such queries. This will allow Postgres to spawn these many workers (subject to the overall limit of max_worker_processes) to speed up the creation of B-Tree indexes. If you have CPU to spare, you can trade CPU for disk bandwidth by compressing the pages that are written into the WAL files. This reduces the amount of data that needs to be written to disk, at the expense of more CPU cycles to compress the data. It also reduces the size of data that needs to be sent across the wire for streaming replication. The OS automatically manages and uses memory that is unused by any application for caching data read from and written to the disk recently. This greatly speeds up disk-intensive applications, and certainly PostgreSQL. In Linux, the most popular host for Postgres, the size of the OS disk cache cannot be set by the user. It’s management is internal to Linux. Under memory pressure, it will yield disk cache memory to applications. # of the disk cache that is available to a single query. If you have memory to spare and queries that use temporary tables heavily, increasing this value can speed up such queries. The memory used by VACUUM, index creation and other such maintenance commands are controlled by the configuration setting maintenance_work_mem. Increasing this amount can speed up these operations, especially on indexes or tables that need to be recreated. The memory used by the autovacuum workers can be taken from the maintenance work memory (by setting autovacuum_work_mem = -1) or configured independently. Disks can be made bigger, faster or more concurrent. The size of the disk is the only thing that PostgreSQL doesn’t have to be instructed about. By default, PostgreSQL will not constrain itself from using any available disk space. This is usually just fine. RAID-ed disks and file systems like ZFS can be setup to support more concurrency. That is to say, you can have a few disk reads/writes being serviced concurrently by such file systems because of the way the store or handle data internally. This is currently used only by bitmap heap scans though. The Postgres query planner assumes that sequential reads are faster than random reads. Exactly how much faster is a value you can tweak. By default, it assumes random reads are 4 times costlier. To take advantage of multiple disks which are not mounted as one big single filesystem, you can use tablespaces. With tablespaces, you can places tables or indexes different filesystems. This can improve concurrency and provides an easy way to handle table growth. Read more about tablespaces here. The clients will have to be load balanced across all the IPs that Postgres listens on. There are a few other configuration settings that can be tweaked, most of which use up more CPU and memory. pgDash is a modern, in-depth monitoring solution designed specifically for PostgreSQL deployments. pgDash shows you information and metrics about every aspect of your PostgreSQL database server, collected using the open-source tool pgmetrics. pgDash provides core reporting and visualization functionality, including collecting and displaying PostgreSQL information and providing time-series graphs, detailed reports, alerting, teams and more. 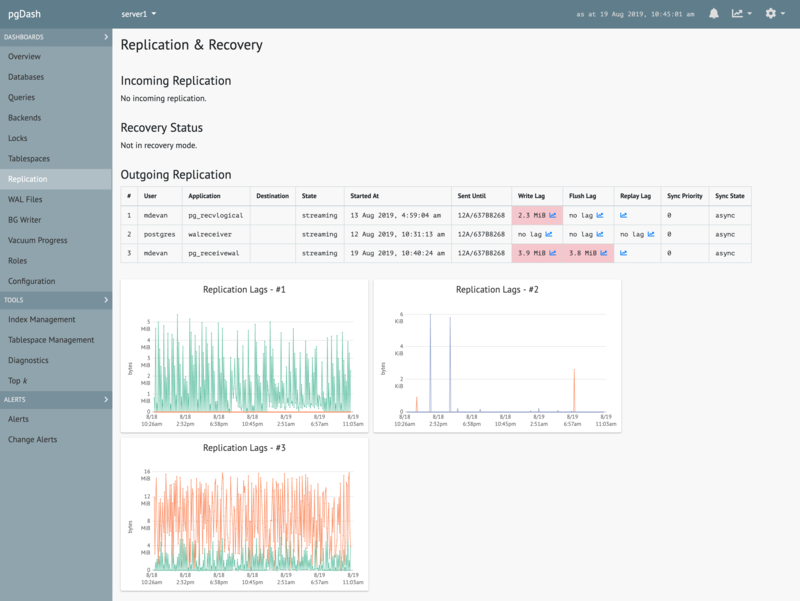 pgDash can monitor replication, locks, queries and more. It can also provide quick diagnostics and extensive alerts. Learn more here or signup today for a free trial. Looking for self-hosted? Talk to Us. Subscribe to our newsletter for the latest on monitoring and more!